A towering figure of the English musical establishment, whilst remaining an Irishman in his blood and bones until his dying days, Stanford wrote more than thirty works for chorus and orchestra as well as seven symphonies. The Requiem Mass was composed in memory of the painter Lord Leighton, a figure of enormous stature in English culture and society. 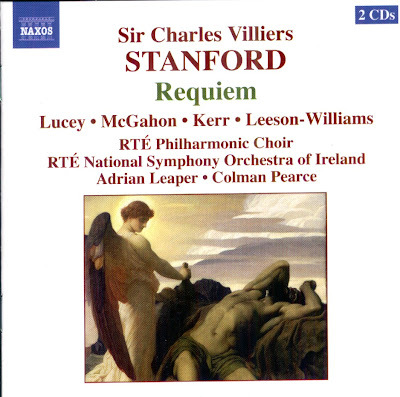 Although in scale the Requiem almost equals that of the great Requiems of Berlioz and Verdi, the orchestral style is largely content with economical underpinning of the vocal forces and telling use of instrumental solos, a reminder that Stanford was a highly-regarded symphonist. Charles Stanford was born in Dublin on 30th September 1852 as the son of a prosperous Irish lawyer. Both his parents were extremely musical. The young Charles learnt the piano and organ and gained a first-class classical grounding at what was said to be the finest school in Dublin. In 1870 he went to Cambridge as a choral scholar, he took over the conductorship of the Cambridge University Musical Society when he was twenty. At the same time he became the Trinity College organist. He graduated in 1874 and spent much of that year and the next two studying in Germany, first (and unfruitfully) with Karl Reinecke in Leipzig and then, at the instigation of Joseph Joachim, in Berlin with Friedrich Kiel, a rare man and a rare master. Stanford's career rapidly developed. In 1875 he received a commision for incidental music to his play Queen Mary; his First Symphony of 1976 gained second prize in a competition, a Festival Overture (1870) was a success at the 1877 Gloucester Three Choirs Festival. He took on the London Bach Choir in 1885; Oxford awarded him the honorary degree of Mus.D. in 1883, as did Cambridge in 1887, where he was also appointed Professor of Music in the same year. He was able to introduce several of the greatest composers to England for important performances. Stanford died on 20th March 1924. His body was interred in Westminster Abbey under a stone inscribed A Great Musician, close to the remains of Purcell. The Requiem is, in fact, a central work of Stanford's output and the scale of the Requiem equals that of the great Requiems of Berlioz and Verdi. The DCD was released by Naxos, 2004, (DDD). Naxos 8.555201-02.